I just finished this lampshade yesterday. My step-mom gave me the lamp base. The lady and gentlemen on this base are dressed for dancing and courting. They are wearing matching outfits in green and white and the lady has rose colored trim on her dress. 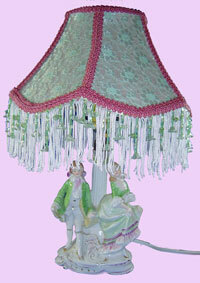 I used 100% off-white silk underneath the light green lace. It is trimmed with rose gimp (this picture makes it look darker. 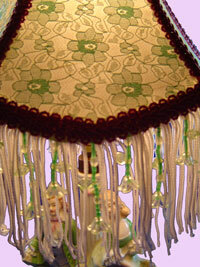 See the first picture for better color) and white fringe topped with a light green beaded flower fringe. With the light on, it looks beautiful. It is now ready for someone's special room. 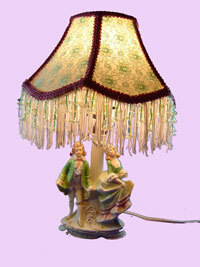 Since it uses a 40-watt light bulb, it would be a good night light or task light. It has a 6' white cord and the push through on/off switch is under the shade. It will be for sale on my website for $45.00 plus shipping or at Exquisite Things Gift Shoppe in Bemus Point, NY in Chautauqua County this summer.